Cook pasta shells according to package directions and drain. Preheat oven to 350. Grease bottom of two 13x9x2 inch glass baking dishes. In a large bowl, beat egg. Stir in ricotta , cheddar cheese, 1-3/4 cups mozzarella, ½ cup parmesan and the parsley. 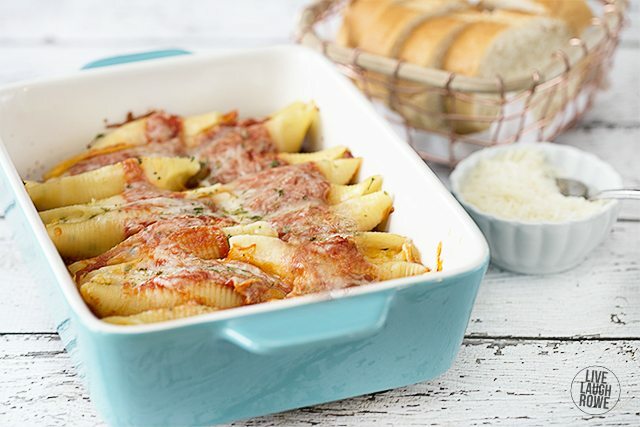 Assemble: Spread 1 cup of the pasta sauce in each of the baking dishes. Fill cooked shells with ricotta mixture. Arrange filled shells in baking dishes. Pour remaining sauce over shells. Sprinkle remaining mozzarella, parmesan and a dash or two of parsley over the top. Back covered with foil until bubbly, approximately 45 minutes. Uncover and continue to cook until the cheese is melted, approximately 5 minutes. Let stands for 5 minutes or so before serving.